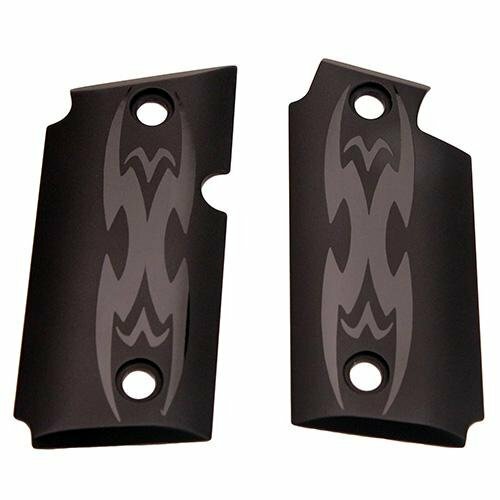 238 AL Blk Tribal Grip Set by SigTac at Freedom from Government. MPN: GRIP-238-AL-TRIBAL. Hurry! Limited time offer. Offer valid only while supplies last. Sig Sauer alloy grips are precision machined from a solid billet of aircraft grade 6061-T6 Aluminum and treated with a natural clear coat finish. Sig Sauer alloy grips are precision machined from a solid billet of aircraft grade 6061-T6 Aluminum and treated with a natural clear coat finish. Manufactured by Sig Sauer to high tolerances, these grips provide excellent ergonomics and will handle the most extreme conditions. If you have any questions about this product by SigTac, contact us by completing and submitting the form below. If you are looking for a specif part number, please include it with your message.